Faith and I and our babies went over to Leighann's today to scrapbook. I didn't actually scrapbook but I did make some cards. I also played some Wii fitt :) The babes were all really good, and they all took turns napping. We didn't get a ton done, but it was nice to hang out and craft together. These are the youngest babies of our Tuesday night small group. They are all about six months apart. We keep saying that we need to get a picture of all three boys together, but usually someone is sleeping, eating or not with us. Today they were actually all awake and together at the same time so we tried to snap a picture. We had such a great weekend. Friday Matt came home from work just a little early and we packed up and booked it out to Nuevo to meet up with the Flores fam. 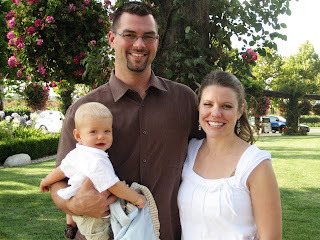 We went to Temecula and went to dinner at South Coast Winery to celebrate Danny's birthday. South Coast is a beautiful place and we got to eat outside on a beautiful patio overlooking the winery as well as a wedding that was taking place. We had declious food, a couple of good bottles of wine, and enjoyed our meal immensley. The boys were very good. It helped that we sat outside. They enjoyed chomping on their cereal and biter biscuits. The guys. It makes me laugh that Ethan is the only one looking at the camera. Our table at the restaurant. The weather was perfect. Dog farts are the worst. This is one of those posts where I complain, because quite frankly I'm in a foul mood and I want to complain about it. I was kept up nearly all night by the neighbor's barking dog. I would just fall asleep, and then he would start up again. I was seething in my bed. I kept thinking of things to do. I was thinking of looking up their phone number and calling them repeatedly to see how they like being kept up all night (they live catty corner to us and we don't even know these neighbors), I was thinking of throwing poisoned meat over there. I know, that is horrible, but when you are tired and kept up all night horrible thoughts sometimes cross your mind. I was thinking about getting other neighbors to complain to the city with me. This dog barks ALL the time and I've simply had enough. Then this morning we were greeted with a kitchen and dining room full of ants. Yesterday my friend Tawny and her sweet daughter Sammy came over. 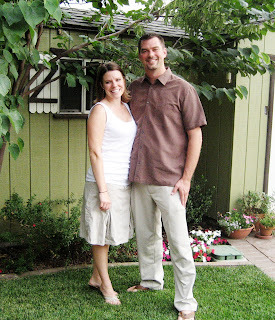 Tawny and I met in the credential program at UCR. 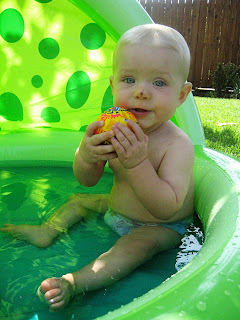 We don't get to see each other often, but it sure is nice when we do :) I set up Ethan's little pool and we let the kids splash around and play. Thankfully the weather was a bit cooler so it wasn't too bad hanging out outside in the afternoon. Sammy was so cute running around saying her little words and playing with everything. E mostly liked to chew on the little balls. He wasn't very nice about sharing with Sammy. Ethan was ready for a nap after only about 30 minutes, so I put him down and chatted with Tawny while Sammy amused herself with the pool and with Cookie. After Ethan woke up from his nap we enjoyed some yummy chips and salsa and guacamole that Tawny made. Last night we had our weekly dinner with our friends. Jeff and Carmen were so kind to pack up dinner and bring it to the pool at their association so that the kids could all swim. We normally don't bring kids, but James and Faith didn't have a sitter. Since it was at the pool I told my mom she didn't need to babysit and we'd just bring Ethan. He did wonderful and was a good boy all the way until we left at 8:00. It's so nice he is able to stay up a little later now. Anyhow, we got home and put him to bed and he was so tired, but he decided to play for about 30 minutes. He was just rolling around, talking and playing. After a while I heard him start crying and it sounded funny, so I went in to peek. 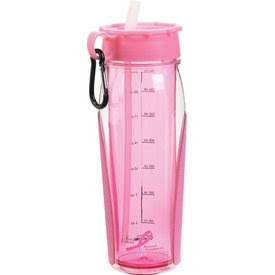 ...my big girl sippy cup. Yes, this is mine. It is for people like me who no matter where your glass of water is, you manage to knock it over and spill it making a huge mess. This usually occurs shortly after you've filled it full of ice and water. This is also handy when you have a baby who grabs and bats at anything and everything near him and manages to spill your water for you on the rare day that you don't do it yourself. It's also plastic, so it won't break and shatter glass all over your floor for your baby to crawl in, or for you to step on which would cause a bloody mess. One great feature about this is that it's double lined, meaning it won't sweat all over your coffee table or dining table. No one likes wet rings on their furniture. The one question I have is why didn't I just get one of these a long time ago? It sure would have saved me a lot of cleanup. I think the days of E sleeping until 7:00 are behind us for now. He has decided that 5:30-5:45 is really when he prefers to wake up. He used to be content in his crib and play for a while... not anymore. 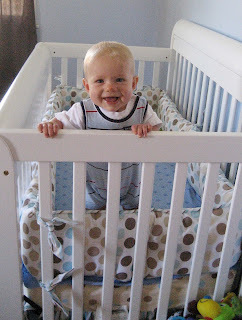 He cries and sticks his arms out of the slats of his crib like a prisoner. He is starving when he wakes up so I get him and feed him (as long as it's at least past 5:30). Definitely not my idea of a nice time to wake up. I'm trying to look at the positive side of this forced start to my day. I think I found it... I've been walking everyday :) If he were to sleep until 7:00 I may just decide it was already too warm to go for a walk, but since 6:00 is such a delicious time of morning outside this time of year, I throw my clothes on and go. If you look really closely you can see one of the huge blisters on E's feet from scooting. Mama the paparazzi is at it again. Ethan was making funny faces. On Friday Ethan took a digger face first into the carpet. He skinned up his nose pretty bad. He's resilient and it is getting better, but it looks so sad. The same day he also scooted into the doorway, the wine rack and a wall. I'm sure this is the first of many more self inflicted injuries. Here is a video clip of Ethan scooting yesterday. I'm telling you, he gets faster every day. This weekend we decided to try out our new smoker. We chose to do a whole chicken for our first smoke. 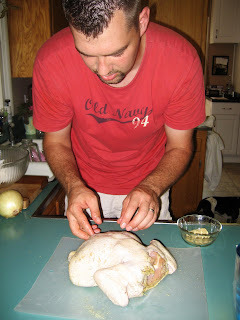 Matt prepared a brine in the morning and let it marinate for a few hours. He then rubbed it down with a mixture of lemon pepper, rosemary, paprika, and salt. Around 1:00 he got the smoker fired up with some apple wood and then put threw on the bird. This was a big bird... around 5 pounds (from Costco). It smelled really good. It reminded me of camping and made me wish were in our favorite camping spot in San Simeon. The weather was really nice (a lot nicer than it has been), and so we enjoyed hanging out outside part of the time while the meat smoked. We had anticipated it taking around 4 hours, but Matt didn't keep the fire quite hot enough, and the bird was extra big, so it ended up taking closer to 7. I came across this on a website and just had to share. 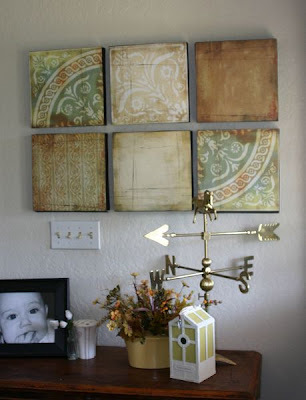 It is such a cute yet easy and cheap decorating project. This person cut some styrofoam into 12x12 squares, then used some 12 x 12 scrapbook paper to cover it. She covered edges w/black card stock. So easy, and cheap! I am trying to think of a place I could do this in my house. Matt got home late last night. Yippeee! I'm so happy to have my hubby home. I miss him so much when he travels. He is pretty tired. We'll probably just be laying low and relaxing this weekend. My mom and Beth got us a smoker for our anniversary. We're looking forward to smoking some meat. I think we'll start out with a chicken and then move onto some tri tip or something. Thanks guys, that was really thoughtful of you! Silly title, I know. Here are three little video clips of Ethan scooting yesterday. It's nothing terribly exciting. I'm really not kidding when I say that he gets faster everyday. Today he's already faster than yesterday! I can't remember if I mentioned that he is now saying "da da". He doesn't know what it means yet, but it's his new favorite thing to say. 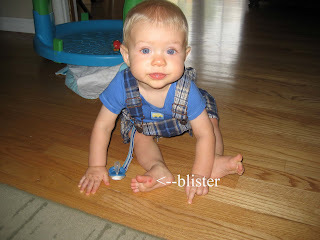 Oh, other exciting news.... today Ethan sat up on his own twice (from the crawling position). I am quite happy about this as it will make my life easier! When he wants to sit up I won't have to come help him out. We spent the night at my mom's last night and Ethan did great. It was Cookie who drove me NUTS. She is obsessed with trying to be friends with my brother's new kitten and the other cat, and I seriously wanted to chuck her into the green belt next to my mom's house. She would not leave those cats alone, and she was wining constantly. Arggghhh. Matt and I had a great anniversary. Matt took me out on Saturday and I got to buy a few little odds and ends that I had been wanting. I got a nice wood cutting board, a mandolin slicer, new kitchen rugs, and a pedi egg. Have you seen those pedi eggs? They are so great! Without sounding gross, they get all the rough skin off your feet, it works so well! Matt says it's just a cheese grater for feet, which I have to admit is kind of a good description.